Red curtains, mysterious aphorisms and a threatening man in a cowboy hat - David Lynch is back! Scott Macaulay speaks with the director about his dreamy depiction of life beneath the Hollywood sign, Mulholland Drive. David Lynch describes his latest film, Mulhollhand Drive, as, simply, "a love story in the city of dreams." Indeed, "dreamlike" is an adjective that has attached itself to the director's work from the start. From the child's nocturnal imagining of The Grandmother to the anxious nightmare of Eraserhead, to the full-on night sweat of his overlooked masterpiece Twin Peaks: Fire Walk with Me, Lynch has shaped his stories with the eerie logic that can only be created by the mind at rest. Mulholland Drive, opening from Universal Focus this Fall, contains more tosses and turns than any Lynch film yet, and if the director is cagey about his creative process, maybe that's because nothing is more deflating than a neatly analyzed dream. The movie tells the tale of two women - Betty (Naomi Watts), a perky would-be actress from Ontario who arrives in L.A. looking for stardom, and Rita (Laura Elena Harring), a glamorous amnesiac who has just escaped an attempted murder. Beyond revealing that the film's first hour is a kind of eroticized Nancy Drew mystery, as the two attempt to unearth Rita's true identity - and that a hipster film director, forced by his mob financiers to cast an unknown actress as his lead, is somehow thrown into the mix - it's almost futile to summarize the plot. That's because this narrative setup, which takes up the film's first hour, is mostly material shot by the director as a television pilot for ABC. When ABC passed, and French producers Pierre Edelman and Alain Sarde offered financing for a feature version through Studiocanal, Lynch radically re-imagined the work, turning text into subtext as he trasnformed a pop Hollywood melodrama into a corrosive meditation on the way visions of celebrity and fame twist and flail in our subconcious. In the film's second hour, identities change, plotlines are casually discarded, and Lynch brilliantly stages the surreal setpieces for which he is justly acclaimed. Of course, Lynch has been down this road before. Mulholland Drive's ruptured narrative, doubling of characters and waking nightmare conclusion have a precursor in his 1997 feature Lost Highway. If this new film has, so far, been received more favorably by the critics, perhaps that's because the Hollywood setting - Mulholland Drive contains some of the most keenly observed Tinseltown satire of recent years - effectively contextualizes the psychic pain at the film's core. Or perhaps, as studio filmmaking gets blander and more pre- determined, the Lynchian trademarks viewed as excessive by some are now comforting reminders that cinema is still capable of greater imaginative possibility. Indeed, only in the world of David Lynch can menacing figures uttering mysterious non sequiters, midgets in curtained rooms, and a rotting transvestite be images both disturbing and re-assuring. FILMMAKER: Could you talk about the process you went through to re-conceive Mulholland Drive from a TV series into a feature film? 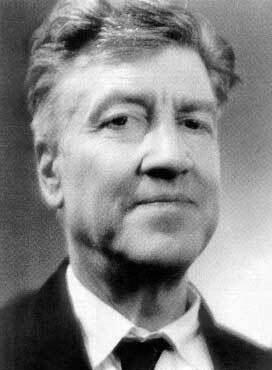 DAVID LYNCH: [Mulholland Drive] started as an open-ended pilot. At a certain point, ABC saw that open-ended pilot and hated it. That could have been seen as a huge negative, but, in fact, it was a blessing. About a year later, Studiocanal bought it from all the parties that were involved from the beginning, and it came time for me to really commit to making it into a feature. I had zero idea how I was going to do that, so it was a time of high anxiety. One night, I sat down, the ideas came in, and it was a most beautiful experience. Everything was seen from a different angle. Everything was then restructured, and we did additional shooting. Now, looking back, I see that [the film] always wanted to be this way. It just took this strange beginning to cause it to be what it is. FILMMAKER: When you say you had zero idea of how to finish it, why was that? LYNCH: Because it was, you know, an open- ended thing in the beginning, and now it's a close-ended feature film. It was a big change, and it required ideas - ideas that I was so happy with when they came in. FILMMAKER: When you say the ideas came to you about how to finish the movie, in what form did they come? LYNCH: I sat down in a chair at 6:30. And at 7:00, they were all there. They came out of a kind of darkness and made themselves known. LYNCH: I wrote them down right away, because if you forget something like that you commit suicide. It's important to write them down in a certain way so they'll always trigger those [same] ideas again. Pretty quickly after that I started writing out how to reshape things. I restructured and added [material]. FILMMAKER: Can I ask more specifically what those ideas were that came to you in that half hour? LYNCH: The ideas were how to make an open-ended thing restructured so it would hold an ending. It was strange because it was as if the clues were all there in the original script, but they weren't really. I don't know how to explain it. it was strange. FILMMAKER: What about the physical and emotional process of making the pilot and having it rejected by ABC - how do you think that experience found its way into the feature? Or did it? LYNCH: Well it did... because I went that route [initially]. I'm a sucker for a continuing story. The chance to do a continuing story is the only reason I like television. Somewhere during all of this I heard that ABC, or television [networks] in general, had done polls and found out that a lot of people don't always watch the same show [every week]. They miss a couple of episodes a month. So [the networks] were becoming afraid of continuing stories. They wanted stories that had closure at the end of the 42 or 44 minutes. That [knowledge] could have fed into this, I don't know. But the way I look at it is - [ABC] played a big part in making this the feature that it is today. So it doesn't really matter what kind of strange route we all have to take. We get to some place, we look back, and we see that it was kind of meant to be. FILMMAKER: What are your thoughts about doing another TV series? FILMMAKER: How do you think the passage of time between making the pilot and shooting and editing the feature, shaped those ideas? LYNCH: They say the mind is working even when you're sleeping, like it's on a backburner. So, I think it might have been percolating these things during the passage of time that was required to do all the legal work. FILMMAKER: Do you drive Mulholland Drive often? LYNCH: I live near it, and I drive it quite often. Do you know Mulholland Drive? FILMMAKER: Yes. I've driven it many times. LYNCH: Yeah. So it's a mysterious road. It's rural in many places. It's curvy, it's two lanes, it feels old. It was built long ago, and it hasn't changed too much. And at night, you ride on top of the world. In the daytime you ride on top of the world too, but it's mysterious, and there's a hair of fear because it goes into remote areas. You feel the history of Hollywood in that road. FILMMAKER: You've said that in a film mystery is good and confusion is bad. FILMMAKER: How in your films, and particularly this new one, do you know which an audience is feeling? LYNCH: You sense it yourself when the ideas talking to you form a mystery. A mystery is one of the most beautiful things in the world. It pulls you into the world, and the ideas have a way of putting in clues. They're not spoonfed to you, but they're there. All you have to do is pay attention, and use your intuition. FILMMAKER: How do you translate that process for the actors? Naomi Watts's character, for instance, from the first part of the movie to the end, goes through a profound change. How do you talk an actress through such a journey? LYNCH: You start by talking, just like you said. The first rehearsals are critical, because there you rehearse and talk, rehearse and talk - action and reaction - until you see in their eyes that they've caught the character and the drift of the feeling of the ideas that, you know, I caught. Once that happens, in terms of acting and sets and props and locations, then you're rolling along as one unit on the same road. It's all about bringing people in tune with the ideas. FILMMAKER: Tell me a little bit about your casting process. LYNCH: Get the right person for the role. In this case, I needed to look in an area where I could find people who would go for a long time in a series. But I looked for them in the same way [that I cast MY features]. I start with still photos, and that gets narrowed down, and eventually I sit one on one [with the actors]. I never read anybody - nobody reads any part of the script. I just talk to them, and as I'm talking to them I'm running the scenes of the film. FILMMAKER- Do you cast on the basis of those meetings, or do you then give out the script and call people back? LYNCH: No, no. They don't read before they're cast because then I'll just start wanting to rehearse. It's unfair to an actor, I think, to have them do a cold reading. They could be the right one, but they've got the wrong take on it at first. It could be a heartache for them. It's not the way to find the right person in my book. FILMMAKER: This is, I think, the first of your movies to in some way address moviernaking as a subject. Did your experience making films in Hollywood, or in casting your lead actresses, inspire this movie? FILMMAKER: Do you remember the first time you heard the Roy Orbison song "Crying" which appears in this movie? LYNCH: I heard "Crying" riding with Kyle [MacLachlan] to the airport in New York City while going through Central Park. I said, "I've got to get a Roy Orbison album that has 'Crying' on it," So I got it. And I forgot about it when I heard "In Dreams" - it was perfect for Blue Velvet. Ironically, "Crying" is in Mulholland Drive, sung in Spanish. FILMMAKER: I heard you're launching your own Web site: davidlynch.com. LYNCH: I am. I've been working on it for two years, and it's going to launch in October. It's a pay-per-view membership site. It starts where it starts, and it's going to go from there. It's an experiment. There are many things on it - it's a point of departure. FILMMAKER: Has it been fulfilling to work on so far? LYNCH: Yeah. I'm into Flash animation and Photoshop big time. After Effects and a lot of DV work. What's strange is that these different things are homes for new ideas you wouldn't necessarily use for feature films. So it's broadening the world of ideas. FILMMAKER: How do think the films you make relate to your life and what's going on in your life at the moment? LYNCH: There must be a relationship, but I don't know exactly what it is. All I know is, I fall into something, and I have a yearning to turn it into a film. FILMMAKER: Some scenes in the film, such as the hit-man scene, seem to be used almost for tonal or textural reasons, as opposed to narrative or character development. That scene, for examples, throws in a dark humor that is very effective at that point in the film. LYNCH: Well, everything has its place. So much of this is like music. You're going along, and another instrument is introduced, another melody. And it's introduced in a certain way, with a certain pacing, certain harmonies. It's not willy nilly - "Oh this scene would be nice here." I guess you could see it that way, but it's really the ideas that are talking to you. FILMMAKER: I've read some very psychoanalytic interpretations of Mulholland Drive. Do you think about your stories in those terms when you write them? LYNCH: If you're true to the ideas, sometimes these ideas can be bigger than what even you think. It's weird. It's just important to be true to the ideas. I have my take on everything, but since things sometimes get more and more abstract I know there are going to be lots of interpretations, and they're going to be as valid as mine. FILMMAKER: These days everyone wants an audience to feel exactly the same thing. LYNCH: That's a narrow road. And that [approach] can be a very entertaining and a fantastic experience - I'm not putting it down one little bit, but cinema is a very wide road. It can do many things, and some stories allow for more abstractions. It's still important to not lose people along the way. I think [Mulholland Drive] walks that line - there's a lot to see if you pay attention. FILMMAKER: Is it important to you that your movies have that space for different interpretations? LYNCH: It's the beauty of things that we might be the same at our core, but we're very different on the surface. We may see the exact same thing, but it's beautiful how the same thing strikes people differently.